When my daughter first tasted this sponge cake, she told me this cheesecake is so light and good. But I told her that this is not a cheesecake but just a normal sponge cake. She just couldn't believe it! I am regret that I didn't make this good sponge cake much earlier. 1. Prepare a cake pan, don’t need to line paper. 2. Immediate separate cold eggs from fridge (easy to separate this way) into two mixing bowls. Set aside to return to room temperature. 4. Immediately add in flour, quickly stir to become batter (at this stage, the batter is thick. Also suggest to transfer this batter to another clean mixing bowl), then add in milk, mix well. 5. Add in egg yolk one at a time, stir well on each addition. The batter is slightly runny if compare to normal chiffon batter. 7. 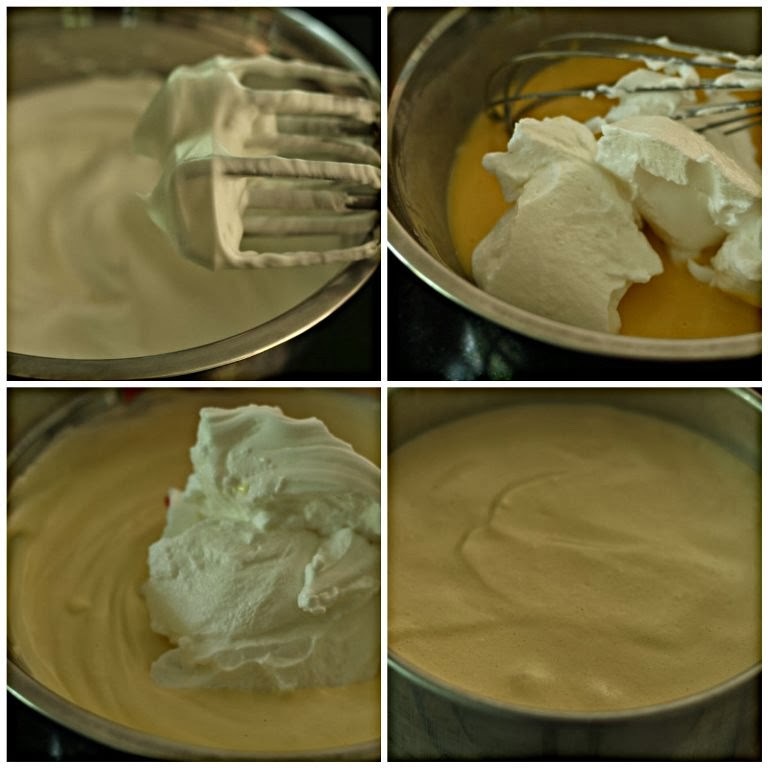 Take 1/3 of meringue and use a hand whisk to mix well with egg yolk batter. 8. 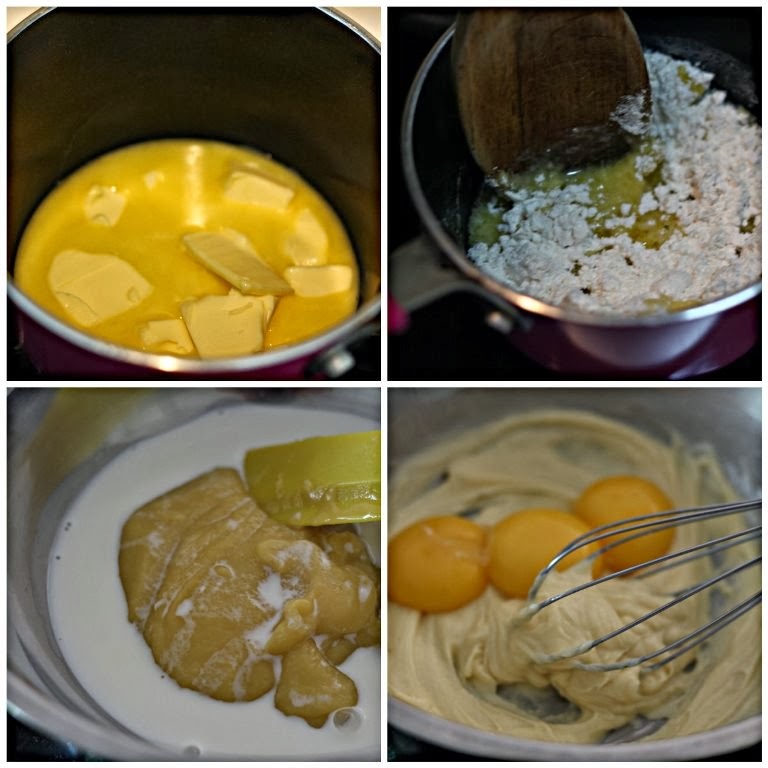 Fold in 1/3 of meringue and use a silicone spatula, gently fold with egg yolk batter till slightly combined. Fold in the balance meringue and gently fold till well combined. 9. Pour into cake tin, bake at pre-heated oven at 140C (no fan) for 25mins at low rack, then increase to 170C (no fan) for another 25mins. 10. Once baked, turn your chiffon tin upside down and cool completely before remove from the tin. Oh wow, gorgeous cake. Yes, I saw this slice cake at your Instagram page. Indeed, it sure fool me thinking that this is a cheesecake. Im sure alot of us will follow suit to bake this cake to indulge in. Looks super soft and spongy, Well done, Sonia. I think these photos are well taken . Love this feather light sponge cake. Bookmarked the recipe. thanks for sharing. Wow, Sonia this is really a good and nice cake, and it is very beautiful. Can i ask, can i put the bottom with baking paper? cause i don't have a removable bottom tin. thanks. Sally, I suggest you replace corn starch with 1/4tsp of cream of tartar as to stabilize the meringue. Wow the cake looks gorgeous.. So spongy..too good dear.. Even i thought it was a cheesecake..
Wow .... so beautiful and its looks very soft. Oh Wow! this looks gorgeous. Oh yes, it's really very gold in color! Very pretty and love the fine texture! Hi Sonia, after reading ur upload, i cannot wait to try out this cake. M baking it in the oven now. Hopefully all will turn out right like urs. Can't wait to see the end product. Btw, u said u removed the cake using ur hands. Is it like removing chiffon cake? Thanks for all ur delicious recipes! Alicia, oh, you are too fast ^_^. Ya, like remove chiffon cake. Sonia, I have also tried this method long ago but not very successful cause the cake not very well rose. But still no time to troubleshoot the problem. hehe.... Yours look great. Really soft & perfectly done. Kudos ! Hi Sonia, my cake din turn out like urs. �� It cracked at the top although i followed ur recipe to the T. And when i overturn the cake to cool after taking out fr oven, the removable base slid down. Sigh! Wat cld gv gone wrong? Sonia, thank you very much for sharing this beautiful sponge cake. Looks so good. No cracks at all. Just perfect! Alicia, I suspect is the oven temperature problem , every oven is difference , top cracked that means top heat too high and the base slid down is under bake .Maybe you could reduced temp to 160c at the second stage and move cake tin one level up or turn on the oven fan. Thx Sonia for ur reply. Will try baking it again n hopefully it will turn out like urs. Luv the taste though. Su cake esponja es maravilloso me encanta,abrazos. Toujours de nouvelles gourmandises chez toi. J'aime beaucoup. Speechless and my heart gets so excited seeing this!!! Beautiful spongecake and I'd love to try this one day!!! Impressive! No shrinkage at all! I will bake this soon! Now if I could but I can't lol! Hi Sonia, any substitute if I don't have a non stick round baking tin? Kimmy, just perfect because you need a Not non stick pan or normal cake pan as the batter need a wall to climb up. Sonia , this looks like a more easier version of your orange sponge cake :D Would love to try this sometime ! Hi Sonia, you mentioned this cake is less sweet. So can I increase the castor sugar to 70g? Will it affect the texture and will it be too sweet? If not, kindly advise how much to increase to? Appreciate your reply. Thanks! This cake looks absolute amazing! Will try out the recipe!! Sonia, saw ur cake the other day but too tire to leave a message here,now only come. 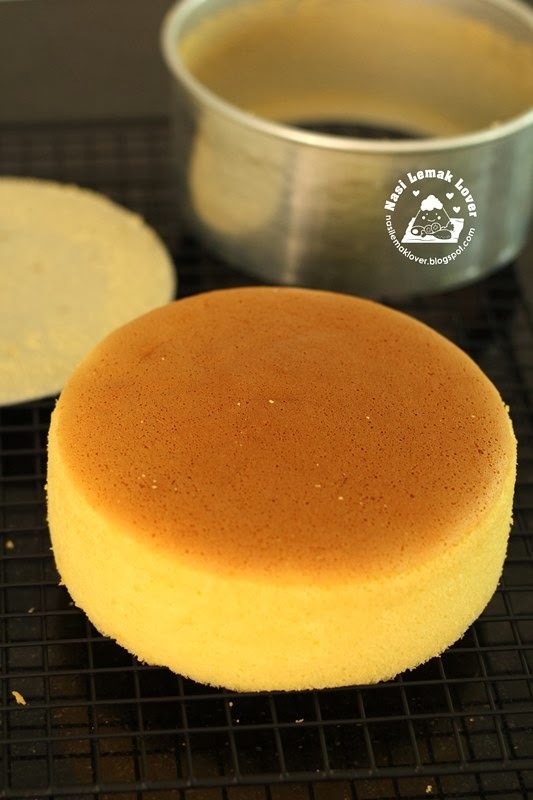 Your cake does look a bit like Japanese light cheesecake hoh, esp with a smooth cake top. Looking forward to see your video clip soon. Sonia, may I know yr cake tin height? My 6" cake tin with removable base is only 1.5" tall, is it ok? Your cake in the pix looks tall so thought it is better to check with you. Thanks. teo ai li, why not you give this recipe a try first? then only decide whether to adjust the sugar amount. Zoe, my cake tin height is 3"
Hi Sonia, my smallest pan is 8 inch. I've 8, 9 and 10 inch. Do I do double the recipe or 2/3times the recipe? Thank you! Sonia, I am very excited to try this cake! Chloe, 4 eggs for 7" cake pan, and 5 eggs for 8" cake pan..
Hi Sonia, thanks for reply. Yes will try the recipe as it is. By the way, how did you get such a flat (no dome or crack) top? Even the heat is so even.....I have never been able to achieve this in any of my caking baking. Appreciate if you could shed some light. Thanks! 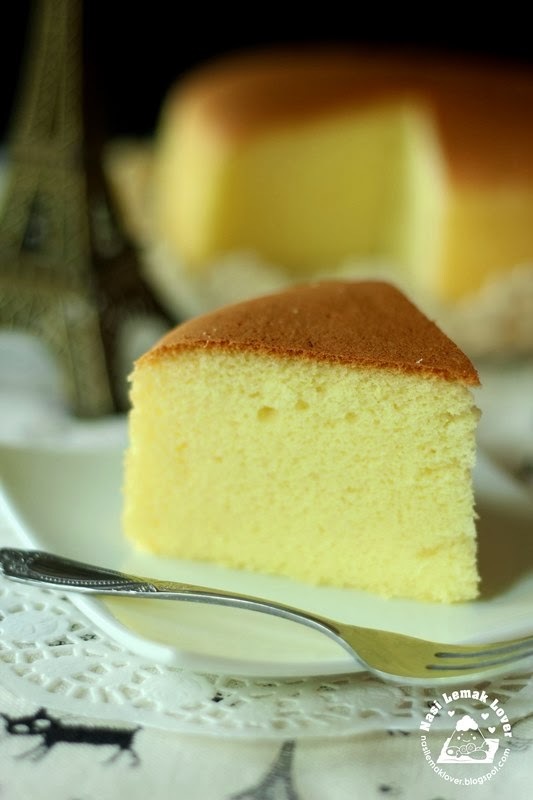 teo ai li, just follow the recipe and tips that I shared in this post, you should get a nice cake. Sonia, one last question to go and I will be baking this tomorrow morning......... how do you remove the cake when it has cooled down? Do I use a knife to go round the cake and slip my hand to the bottom and take out the cake? You mentioned you will try to put up a video on how to do it? Will the bottom stick to the cake tin as it is not lined and greased? Thanks, Sonia! Looks very light and airy! anonymous, I only can measure for you when I make this cake again. please hold. Teo ai li, sorry for my late reply. You can use a flat plastic spatula to go round the cake and bottom. Thanks Sonia! I baked the cake 2 days ago. I failed terribly. My cake was burnt black on top but uncooked in the middle. My cake was already quite brown after 25mins at 140C. So I only baked for 10mins at 170C that's why uncooked in the middle. I took it out because it was already burnt black. I used a 3" height cake tin and the cake rose above 3" (I used 65gm eggs, could this be the reason?). So can I bake using a 7"x3" baking tin? Anyway, I want to try again tomorrow. Any more advice for me? Thanks! hi sonia, hope you had a lovely birthday celebration. 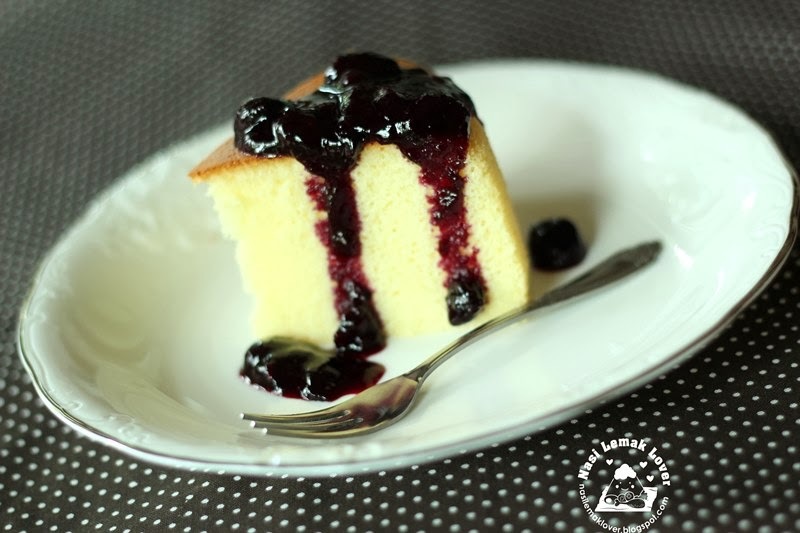 Thanks for sharing this sponge cake recipe, it's something new to me. Made this cake and it is incredibly soft and the sweetness is just right. My hubs thought the cake was bought from a high quality japanese bakery and he ate half of the cake in one sitting. Two thumbs up for this recipe and thanks for sharing! Hi Sonia, what a beautiful cake, encouraging me to make it. One question, can we subtitute the removable not non stick cake tin with chiffon pan? Thanks in advance. Sarina, yes, you can use chiffon pan, but it will turned out like a normal chiffon. hi sonia, i tried making this cake and succeed on the 2nd attempt...its really nice..i was wondering if it can make it chocolate flavour or matcha flavour? I came across your spong cake recipe..and it looked wonderful! Intried it today and cooled about 5 mins before overturning it upside down to cool down. After removing from pan, the bottom part sinked in... Was so upset..wonder what went wrong. Will be glad if you can advise.... I used a non stick normal 6" pan. June, should be ok to make it chocolate or matcha flavour. Anonymous, you used a wrong baking pan, you should use a NOT a non-stick pan. Wow! Soft and cottony sponge cake. If i want to make in 8" mould. using 5 eggs, should I double up the flour, butter etc ...? The sponge cake will shrink if removing while the warm, I tried. So the best is still use a removable bottom tin. 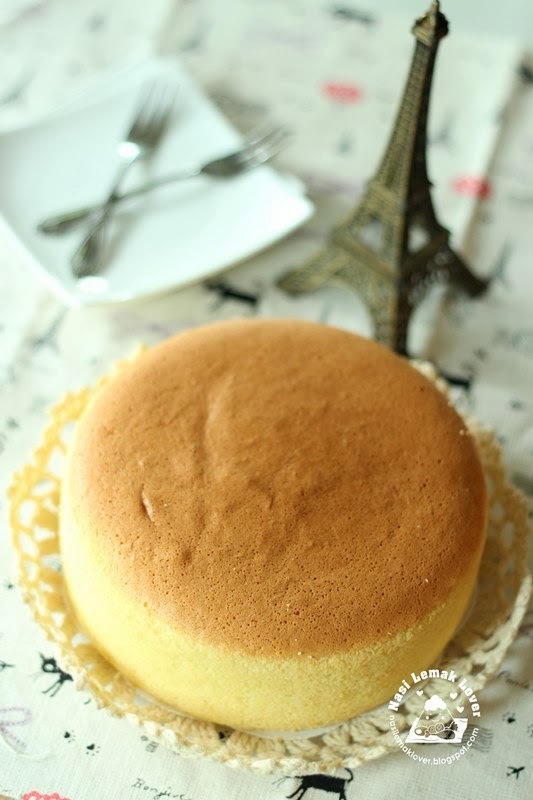 I've tried your recipe exactly each step and the cake after bake was perfect, I've never made any sponge cake which have the smooth surface like that. But one thing it make me confuse about the taste is it has a little sour taste, my mom after try the cake then she thought it's a yogurt cake. I don't know i make any wrong when make the cake or this cake must have the sour taste as your told on the top is your daughter think the cake is the chesesecake. Could you help me to make clear my confuse? Thank you Sonia. Just wondering can i use your swiss meringue buttercream to frost this cake? Will it be too heavy that cake can't support weight? can we use whipped cream to frost this cake? Will it support the weight? Can you please do a 9" pan recipe? I am afraid if I double the ingredients will it still be as beautiful as yours? Hi! If I would like to make a cheesecake using this recipe, when should I add the cream cheese? It looks really spongeful and delicious. Thank you very much. I wld like to try your cake recipe but I live in Australia and we have different egg sizing system, cld you pls tell roughly the weight of size A egg as I tried to google but the results are very confusing (only found Large, XL, etc sizes). Thanh Nguyen, my cake has no sour taste, not sure why has this taste. phoebs, YS chew, I have doubt this cake can support the heavy swiss meringue, maybe non dairy whipped cream should be ok. Anyway, I have to try out then only can let you know whether it work or not. Or maybe you try it out and let me know. Ariana, I was thinking to use this recipe to make into cream cheese cake too. If I will make this, then I will replace some butter with cream cheese. My Lee, the A size egg I usually use is 66g-68g (with shell) , 56g-57g without shell. Hope this helps. Hi Sonia, I made this cake twice and didnt succeed. The first time, the bottom of the cake has a thick and transparent layer of oil. I wondered why and realized I used margarine. Maybe that was why. The second time I made it, this time with butter, the bottom still has a thin layer of oil formed although not as thick as the first one. Also, the cake is not as fluffy because the bottom half of the cake is kind of dense-like. This happens on my first attempt with margarine also. Do you know why half bottom of my cakes are dense? Please advise! Thanks, Sonia! So beautiful! I am going to bake it in time for Labor Day. Beside increasing the eggs to 5 nos, do I need to double other ingredients if I use 8" pan? Thank you in advance from Vivien. I've tried out ur cake. Love ur receipe very much as ur cake really look soft and light. I've tried 2 times. 1st times the cake sank. 2nd times, I increased eggs to 4 coz I'm using 7" pan. And the cake turn out to be good and light. Somehow the sweetness taste is very mild. Maybe I shud add little more sugar in future. Hi Sonia, do you advise to increase the baking time if I bake the batter in 8 inches cake tin? How long the timing should be increased? Thank you! Kitchen corner, maybe 5-10mins for each stage 140C and 170C..
Cherish, I guess this have to do with your oven temperature..suspected low temp at the bottom part..
Shirley, great that it also turned out great using a non-stick pan, Thanks for the tips. Wow thanks for your prompt reply Sonia ! Hi Sonia, I have a successful attempt. Thanks for sharing a great recipe. Cheers! Do you have chocolate version of this recipe? Is it possible if i steam this instead of bake it? Hi Sonia, your cake looks so wonderful with a smooth top- no cracks no doom. My oven is a Panasonic microwave which can also be used for convection baking. It is not possible to turn off the fan. I am sort of a newbie in baking> I am not sure if fan would mess up the cake. Please advice. If you think convection should do fine, please also advice the baking temperatures . Can I use orange juice instead of milk? 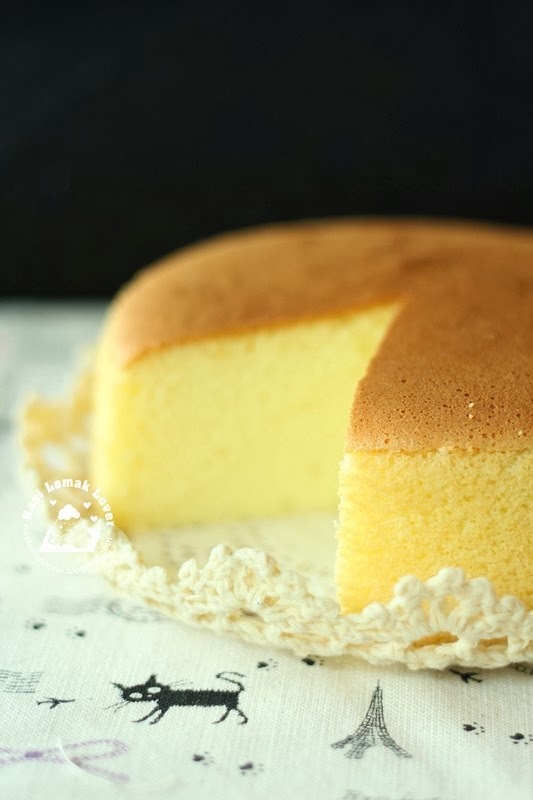 How is the texture and taste of this cake as compared to the cake made using the vanilla sponge cake recipe that you posted previously (16 May 2013) ? Which of the 2 recipes will be more suitable for a soft and fluffy sponge cake base ? Madi Kaung Myat, i am not sure, i think you try out first to check the suitable method. Veronica, should be ok, but i still prefer to use milk. 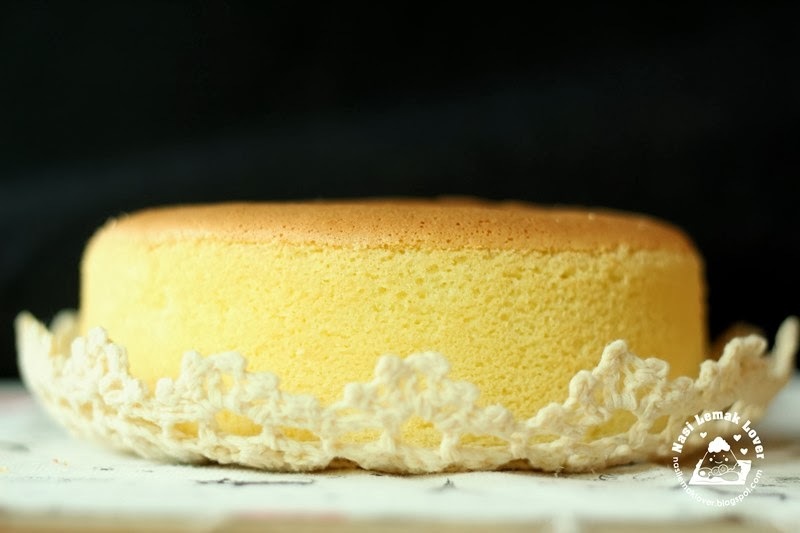 Anonymous, if you want use for sponge cake base, suggest to use vanilla sponge cake. Hi Sonia, your golden sponge cake looks awesome! Thanks for sharing the recipe. I'm new in baking. I tried to bake this cake using a same 6" inches cake pan but my cake doesn't rise. It's only 1 and half inches tall. But it tasted so good just like a Japanese cheesecake. I used unsalted butter and I forgot to add in pinch of salt. Could it be the cause or its due to my skills in beating egg whites or folding egg whites to the egg yolk batter. I'm gonna try it again next week! The milk you are using to do this cake is the cold milk or warm milk? OH MY GOODNESS!!! Absolutely great recipe! Stumbled upon ur recipe today and made it and I wanna tell u never once I have made such good cake! Smells like heaven too! Thank you! The surface was perfect too! My first time ever making a smooth surface cake! Sonia, today I made this in a removable base pan. Looks good when it came out from the oven. I inverted it to cool for almost an hour. When I removed the paper from the base of the cake, the bottom of the cake is not flat, it sort of sunk. I wonder if I left it inverted for too long? Veronica , in my recipe I didn't line paper at all, if you line paper then you have to remove cake from tin after cool maybe for 10mins, the longer you keep, hot steam will turn the cake wet and sunk too. Thanks Sonia. appreciate your advice. Hi Sonia, thanks for sharing this recipe. I tried frosting this cake with non diary cream. It came out great! Btw, i double the ingredient and baked with 9 inch loose base. hi.. thanks for this recipe. i have try it, this morning. follow every step (but add more sugar about 10 gr), i use square pan about 6,5", but it turn out right. soft and spongy. my doughter love it. but i think i cant use it for b'day cake. it just to soft, i think. thank you so much, and big hug for you. 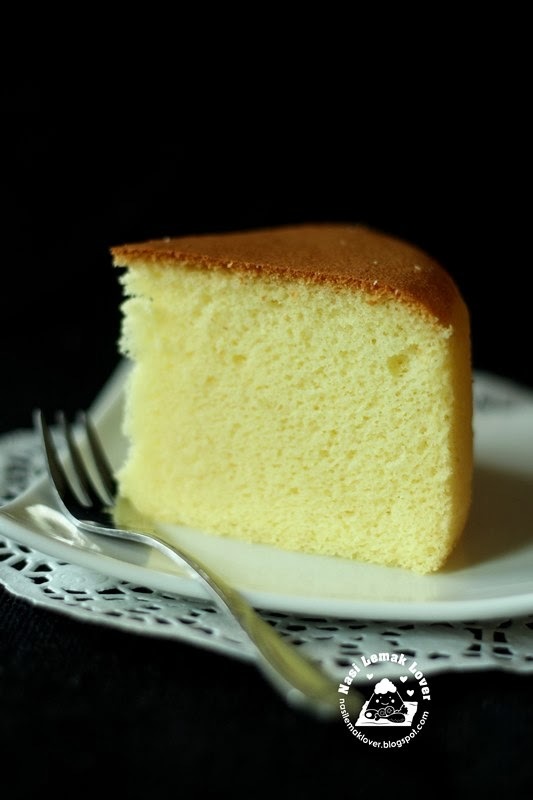 I love your blog and have tried several of your recipe, including this basic sponge cake which i tried today.. the result was good, it shrink a bit after cool down, but never mind to me.. and the taste is just so nice. Thank you sooo much for sharing this recipe and i cant wait to try your other recipe. Hi Sonia, I did this with some adjustment to oven temp as my oven temp is usually hotter. It's awesome! I did not have salted butter so I used unsalted and added about 1/4 tsp of salt. It's a little salty though, have you tried it using unsalted butter before and will you think it's ok if I just use unsalted butter and not add any salt? Hi Sonia, I tried your recipe twice but unsuccessful. My cake rose nicely during the 1st 25 mins at 140 Celsius but the top was slightly cracked later at 160 Celsius then sunk at the middle. When I cut the cake, the bottom of the middle sunk part looked "densed" but the top and sides seems nice and fluffy. I wonder what went wrong? Eleen Tan, every oven is difference, maybe you should try to reduce temp and see how the outcome. Sasa, i suspect you might have under mixed the batter (when mix egg yolk batter with meringue) or meringue was not beat well till close to stiff resulted not sufficient air to support the rise. Never give up and try again, read my recipe carefully, example transfer cooked flour into another clean bowl also an important aspect. Hi Sonia, Thanks for your advise and encouragement. I will try again tonight. Btw, just realised I was using a non-stick cake tin with removable bottom. Could it one of the cause of failure? 1. the measurements were sooo confusing; I'm used to the measurements in mls and I most definitely used the wrong measurements. 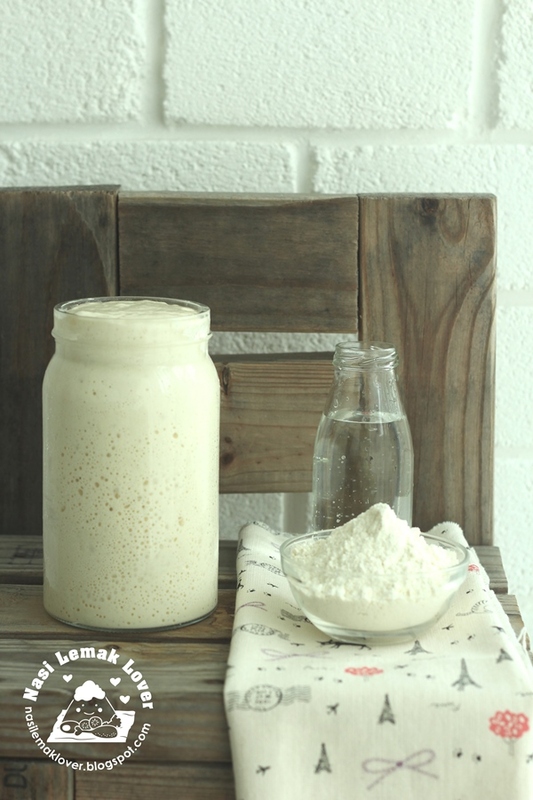 What would the flour, milk, sugar and corn starch be in mls? 2. I used an electric mixer to stir/mix/beat everything on low and when it didn't look right, I did it for longer on the highest setting. There was no mention of when you used an electric mixer and when you used something else, except the one mention of the hand mixer. I can't tell how long you're supposed to beat/mix the ingredients either. I'm a total newbie and this is the first recipe of yours that I've tried. All the ingredients that I mixed looked very liquid, including the meringue which I've never made before. No, I'll try the recipe again (with all the right equipment) but it won't work with the bqq oven. But would it take a while for the meringue to thicken? Annmarie, usually if i use hand electric mixer to beat meringue at speed 3 (range 1-5), it took me around 3mins closed to stiff peak (a small curve at the tip when you lift up meringue). Hi Sonia, the cake looks great. Will try it very soon. Just want to ask if I can use Unsalted Butter instead of Salted butter? Sorry for asking one very silly question here. Thank u Ms Sonia for ur prompt reply. There is one important thing I jus noticed it. We have to turn baking tin for cooling. Do u use a non stick pan when u turn the tin ? Couldn see well in ur pic. How to ensure the cake around the tin will not turn wet when cake is totally covered during cooling. kimhuat tan, i use a normal removable bottom cake pan, and turn it on wire rack to cool. Sonia, I tried your recipe twice but didn't managed get it as perfect as yours. I doubled the recipe (baked in a 8" pan) and followed the steps and temp. But my cake puffed up very high n was done bef the final 25 mins was up. However it sank (base and side) after unmoulding. I think the temp was too high so on my 2nd attempt, I started at 170 deg for 15 mins then reduced to 140 and baked for 1 hr but tanked the top for the first 20 mins. However I had to extend the baking time by an additional 15 mins to have it completely baked. The base of the cake (now the top after unmoulding) still sink. Btw, on my 2nd attempt, I steam-baked the cake hoping to have a better spread of the oven heat. Can you advise on how I can improve the bake? Doreen, if you follow strictly to my recipe, first you should baked at 140C then only increased to 170C, and please use a Not a non-stick aluminium pan. For your 2nd attempted using steam baked, it might affect the temp. Dear Sonia, thank you for reply. Will definitely attempt again. May I know how come after I increased the temperature to 170 degree , my cake start to sink in .. When is 140 degree it raise up Beautifully .. Any idea why? I have tried this recipe twice but i cant seem to get the spongy effect on the cake. Can you advise me what type of flour are you using? (the brand etc).. I have a feeling i might not be using the right flour. m3, i dont know the brand of the cake flour i used as i bought those re-pack from the bakery ingredient shop. You must use the very fine flour like cake flour, Top flour or Japanese cake flour. Hi Sonia.. Thanks for the tip. I shall try with super fine flour this time.. One more question, I cant seem to get the egg white and sugar mixture to reach stiff peaks.. it seems to be still runny even after a long while.. im using an electric mixer.. anything i might be doing wrong? M3, make sure your mixing bowl is clean without any oil and water, and when separate the egg , make sure your hand is dry , do not left any tiny egg yolk in the egg white. Also I suggest you to add 1/2tsp lemon juices in egg white before we start to beat , so you can have stable meringue . Used your recipe to make 9" square cake. I noticed that the 4 corners of batter did not raise as much as centre, resulting in dome shape cake sponge in a square tin (removable type). What can be done to make it raise evenly? Hi Sonia, did you use upper & lower heat in the oven? Phoebe, i have yet to bake in a square cake tin, not sure how to make it raise evenly, sorry. Here, yes, i use both upper & lower heat, normal baking setting. Can I bake this into cup cakes? I.e using cup cakes mould instead of cake tin? If yes, is there any adjustments I need to make during baking? Irene , should be ok baked into cupcakes , adjust the temp and timing . Your cake looks very tempting. You mentioned to other commentators that for a 7 inch tin 4 eggs are needed. Should I increase other ingredients by propotion as well, i.e. times 4/3? Would it work please? Hi, I can't find a not non stick pan here. What else can I use to bake? Hi. Can you advise me how I can convert this into a strawberry sponge cake? TIA! Hi Sonia, I am considering to double the quantity and bake it in a 9in cake pan.. I'm not sure if it will work.. have you tried it before? Thanks! if I double the amount does it means 6 eggs? I intend to use cupcake liners to bake, need your advice, would it be ok? May I know you invert the cake together with the cake tin or remove the cake from the cake tin first then only invert the cake on the wire rack? I baked this cake, everything was GREAT... until it comes out from the oven, the middle sank in although I invert the cake pan. So for the next try I want to try dropping the cake after bake. My cake was round and nicely formed in the oven. But after I took it out from oven to cool, the top sort of collapsed and the cake became concave. What could be the problem? Otherwise, inside is nice and soft. Tastes well too! Christine, Chin Chin Ang, i suspected your cake is slightly over baked. When you remove cake pan from the oven, it will start to shrink, if the cake overbaked, the cake is stick to the wall of the cake pan, thatswhy middle started to shrink. The correct way should be whole cake start to shrink, and sides of the cake start to leave the wall, thatwhy it will shrink together and evenly. Suggest you try to reduce few minutes (maybe 5 mins) from the last baking time. Hope this hekps. You have very good method. I learnt a lot from you. Thx. I have tried the Chiffon cake , a success but hope to get more cotton like texture. I will try tang mein method. Cross my fingers. 2) I overturned the tin for cooling and when I removed, the bottom of the cake looks sinked in. Would like to check what might be the reason? Hi i have the same issue as u. How long did you overturn the tin? I have the same issue as yours. How long did you overturn your tin? Didn't really take note of the time. Did u manage to solve it? I bought a loose bottom pan to make this cake.My previous experience of using a normal pan,lined base resulted in the cake sank down when the liner is removed. I inverted the pan on wire rack and let it cool completely before unmoulding,the cake is perfect! No cracks on top ,no waist,no wet/dense part,just soft,fluffy,cottony soft cake. I used 60g eggs,6"x3"H round pan. Beat meringue to almost stiff peak. Baked for total of 70min,still didn't get the dark brown top like yours,as my oven's temperature is lower. I had this problem too.. everything turn out well except thin layer of the kueh texture at the base of the cake.. what went wrong ? Esther and Ivy, i suspect the bottom heat is not enough , move your cake pan one level up next time. Hi Sonia. Your bluebelly jam looks good! Can i know the recipe? It did not turn out good at all. Later I read the comments and now I get that this must be made in non non-stick round pan. So I'm going to get that cake pan and try again. However I have few more questions. How do you prepare your cake pan? Do you apply butter and flour to the bottom and the sides? Does cake comes off of sides and bottom easily without being in a non stick pan and no parchment paper? Recipe doesn't call for vanilla essence, and cake smelled and tasted like eggs. Can I add vanilla essesnse? 1 tsp? My cake sank in the middle. General reason for this is that your oven temperature is not sufficient/low. Your recipe specifically calls out for 140 C (240 F) for initial 25 mins, later increasing it to 1700 C (340F). I usually bake cakes at 350F here in US in a big oven. Can you please explain why do chiffon cake needs to baked at lower temperatures initially? Just curious. Though I had a failed attempt, I don't want to give up yet, as the cake looks very good and I want to give it another try. I just tried your recipe today! It shrunk from the sides and the top! But the insides seems like there is cooked (drier - top) and not very cooked (wetter - bottom) layer! It was such a beautiful dome in the oven and when i took it out, in less than 3 mins it started to shrink towards the center! I'm suspecting its due to the baking time at low temperature insufficient! As the colour of the cake and everything looks beautiful! taste and texture was awesome too! Or is there some other factors i'm missing out?